This recipe is a huge labor of love. However, fifteen hours later you will have the most deliciously tender, succulent, melt-in-your mouth beef roast with a complex and flavorful sauce served over rigatoni. It will make your family swoon. It will make you want to kiss Michael Symon (assuming you never thought of kissing him before). When my family sees Symon's cookbook laying on the kitchen counter they know they're in for something good. They also know when they see his book it means that I'll be in the kitchen for awhile and his Yia Yia's Sunday Sauce is no exception. Yia Yia was Symon's maternal grandmother and this is her sauce. A rich homemade tomato sauce that simmers for 8 hours, Symon uses this sauce as a base in many recipes throughout his book, including his Italian Braised Beef with Root Vegetables. Heat the oil in a 4-quart saucepan or large Dutch oven over medium heat. Add the onion and cook until transparent, 2 minutes. Add the garlic and salt and cook until everything is soft but not browned, about 3 minutes. Squeeze the tomatoes one by one into the pan, pulverizing them by hand, and pour in their juice, too. Add the wine, beef bones (or broth), bay leaf, oregano, black pepper, and red pepper flakes, if using. Bring the sauce to a simmer, then reduce the heat to its lowest possible setting, and continue to cook for 8 hours. The sauce should reduce by about one third. Taste for seasoning and add more salt if necessary. Remove the bones (if using) and bay leaf. If not using right away, let the sauce cool, then cover, and refrigerate for up to 1 week or freeze for up to 2 months. Let's talk about a couple key points in making a roast. The first, and most important step, is picking a great roast. If you don't buy a great roast then it won't matter how long you cook it or what you do with it. Symon says to use a rump roast, but after years of experimenting I like to use a shoulder roast, preferably black angus. The shoulder cut is a flat cut, which fits well into most pans or slow cookers, and has good marbling throughout. Marbling is very important! I always check to make sure the roast is fresh, meaning that the roast itself is bright red and the marbling is very white. The second step in a great pot roast is to SEAR the roast, on all sides. Searing is one of the keys to great flavor. Another great tip that I learned from Symon is to make sure that when braising, a third of the meat is above the liquid. The meat should not be submerged, so pot size is important. I found that a 9 x 13 dish was the perfect size for this roast. In the movie The Ramen Girl, the broth for the ramen noodle soup was the heart of the recipe. In Symon's Italian Braised Beef, the sauce is the heart of the recipe. Full of complex and robust flavors, which have cooked and simmered for hours upon hours, it is what makes this recipe so good. Season the meat liberally with salt and pepper, as much as a day in advance. (Cover and refrigerate it if doing so and take the meat out of the fridge 30 minutes before cooking.) Heat the oil in a large Dutch oven over high heat. When the oil is on the verge of smoking, sear the meat, about 2 minutes on each side. Move the meat to the side (or remove it from the pot altogether if necessary), and add the carrot, onion, and celery root. Brown the vegetables, about 3 minutes, then add the garlic and cook for a minute or two longer. Add the wine to deglaze the pot, scraping up the browned bits on the bottom. Add the tomato sauce, 1 cup water, and the bay leaves (and the pot roast if you removed it). Bring the liquid to a simmer and taste for seasoning. Add more salt if necessary. Cover the pot and place it in the oven for 3 hours, basting the meat occasionally during this time. Discard the bay leaves before serving. The meat can be removed to a cutting board and sliced if you're serving individual plates, or the meat can be pulled apart with a couple of forks right in the pot at the table and served with plenty of the sauce and vegetables. *Michael's family served their roast over rigatoni, so I did the same. Notes/Results: A fabulous and soul-satisfying dish, one to be proud of for sure. The sauce on this pot roast is so sensational, a winning component of the recipe. This roast would be great served on it's own, with polenta, or with mashed potatoes. I served this 4 pound roast over a pound of rigatoni and it was gone in record time. Many hands fought over the leftovers the next day. This recipe will be made again in the coming months. This recipe is being submitted to Ashlee over at Veggie By Season for the bi-monthly Symon Sundays event. It is also being submitted to Food 'n Flix, where this month's movie is The Ramen Girl. 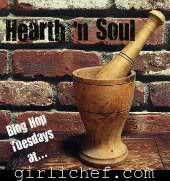 And also to the Hearth 'n Soul Blog hop, co-hosted by my friend Heather of girlichef. I've got my sauce bubbling away in the slow cooker as we speak and I'm SO excited! Yours looks so delicious. Kim, that looks absolutely FANTASTIC! I've never made this Symon recipe, but I made a sauce similar to it for Christmas dinner about 20 years ago. My mom was still alive and when I set the bowl of pasta (rigatoni,by the way) on the table, she looked at it skeptically and asked, "Didn't you say we were having rigatoni with meat sauce?" I absolutely loved, loved, loved the pot roast version of meat sauce (mine didn't have those great root veggies), but mom's version of meat sauce meant ground meat. You've made me want to make this recipe, but I'll have to scale it down for Larry and me. Your devotion to mastering such complex recipes is incredible! Wow, just look at that sauce! I can imagine how delicious this was. You've made me an agreeable person! I agree with your family: "When my family sees Symon's cookbook laying on the kitchen counter they know they're in for something good." When I see that you've made a Symon recipe, I know I'm in for something good too! You've really peaked my interest in him. I'm making the bacon wrapped fish tomorrow night, btw (aack...better take fish out the freezer now). I also agree with your key points to cooking a roast. Especially the searing. Once I discovered that trick, I never looked back. I love what that method does. And because of your descriptions of these recipes, I'd even agree to spend 15 hours making them! i just asked my husband for symon's cookbook. i have been drooling over (him) his dishes on the blogosphere for months now, this just tipped me over the edge! the flavors in this sound outstanding. that's the best thing about those low and slow dishes, the flavor is SO rich, you can't beat it! This recipe looks so hearty and delicious. My husband would be in heaven with this one! This does certainly look worth the time and effort--yum! ;-) That Sunday sauce is gorgeous. And genius linking it to Ramen Girl--love those multi-tasking posts. Kim, you know some of the very best recipes come from that time consuming, labor of love prep you are talking about. What a beautiful roast and the way you described it – fantastic! I can just see you starting a blog called Cooking with Kim (just like Dorie Greenspan) and having members following your recipe picks! Yeah, I know this is Symon’s recipe but wow, did you EVER do it justice!! The Sunday sauce is so similar to my mother's, just smimledlooking at the ingredients. Definitely will do this - perfect for a chilly Minnesota weekend. Wonderful! I love how fall-aparty your roast turned out! And the pasta - why didn't I think of that? Perfect. I'm with Heather on the big serving right in front of me!! When did you say you were making this again?? Thanks sooo much for sharing with the Hearth and Soul hop. Beef roasts are one of my older son's favorite dishes and this one looks like a keeper. You point out some good points about selection and prep of the roast. I'm making this roast recipe now. I really can't wait. It will be well worth the wait.